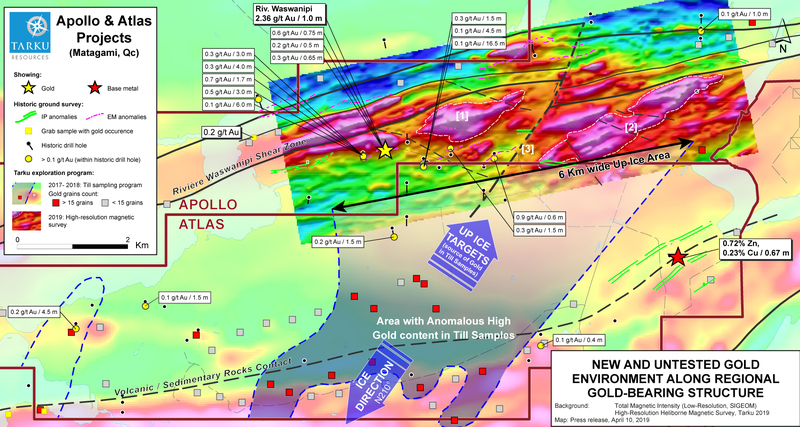 MONTREAL, April 10, 2019 (GLOBE NEWSWIRE) -- Tarku Resources Ltd. (TKU.V) (the "Company" or "Tarku") is pleased to provide an update and new interpretations of its wholly owned Apollo Project, in the Matagami area, Eeyou Istchee James Bay, Quebec. Specifically, a 271 line-km geophysical High-resolution magnetic survey was completed along the 6 km wide favourable zone along the regional Rivière Waswanipi shear zone (see press release dated January 31, 2019). Along with Tarku’s recent till sampling program and historical data compilation, the Company reaffirms the strong gold mineralization similarities with the geological context found at the Detour Lake Mine and the Kirkland Lake Mining Camp. Magnetic data shows historical Au values associated with porphyritic and alkaline rocks in historical drill holes are mostly located at the edge of magnetic highs and none of the drill holes directly intersected high magnetic anomalies (see figure 1). A correlation between magnetic highs and gold mineralization is interpreted as the nearest Au value to magnetic highs is also the highest Au results on Apollo to date, the Rivière Waswanipi gold showing (2.36 g/t Au over 1 m). Several newly discovered large elongated km-wide magnetic highs are interpreted to be syn-deformation alkaline buried dykes swarms or stock intrusions (see zones  and  on figure 1). Major NE-SW cross-cutting faults has been interpreted as offsetting other older structures and rocks within the Rivière Waswanipi shear zone (see zones  on figure 1). A new interpretation of the survey data has generated many high-priority drill targets focusing on structural intersections, interpreted intrusions and historic untested geophysical anomalies. Julien Davy, President and CEO of Tarku, stated: "This magnetic survey strengthens our understanding of the source of the gold in the area. All historical drillholes were further to the South of the Rivière Waswanipi Shear Zone as the gold potential related to porphyritic and alkaline rocks similar to the Detour Mine and the location of that regional fault wasn’t understood as it is today. Tarku’s approach today is based on modern and proven models and the Mag survey results give us more confident in our model and opens door for new Gold targets related to intrusions on our Apollo projects”. In January 2019, Tarku completed a 271 line-km high-resolution helicopter-borne magnetic survey over the main targeted areas of the Apollo and Atlas projects. Flight lines were surveyed at a 100-metre spacing and was conducted by Prospectair (Gatineau, Quebec) and Dynamic Discovery Geoscience (Ottawa, Ontario) to aid interpretations of the mineralized systems and identify new gold targets within the recently define 6 km wide favourable zone. As previously described, Tarku’s 2017 till sampling program identified a 6 km wide favourable zone along the regional Rivière Waswanipi shear zone (RWSZ) that may be the source of the gold grains sampled (see press release dated February 28, 2018). The Apollo Project, 100% owned by Tarku, is adjacent to the north of its also 100% owned Atlas Project. It consists of 97 claims (5,056 ha) centred on the Rivière Waswanipi ductile shear zone. This regional structure is characterized by the presence of alkaline rocks, polygenic conglomerates (Timiskaming type) and porphyry intrusions bearing anomalous gold values on the order of hundreds of parts per billion (GM 52712). This corridor, altered to carbonate-hematite-magnetite, contains the Rivière Waswanipi gold showing (2.36 g/t Au over 1 m; GM 51193) hosted in a porphyritic dyke and tuffs altered to pyrite-fuchsite as well as several porphyry intrusions bearing anomalous gold values on the order of 0.1 to 0.9 g/t Au over 0.6 to 5 m (GM 52712). Collectively, these metallotects present a favourable setting for orogenic gold mineralization associated with alkaline rocks and porphyry intrusions, which Tarku interprets as being similar to those of the regional Sunday Lake Fault, host of the Detour Lake mine or the Kirkland Lake Mining Camp. Tarku cautions that the mineralization at the Detour Lake mine or the Kirkland Lake mining Camp may not be indicative of the mineralization that may be identified on the Company’s Matagami projects and is used as a conceptual exploration model only. Tarku is an exploration company focused on generating sustainable projects for precious, base and strategic metals by conducting exploration in areas with strong geologic potential and high levels of social acceptability. Project generation is the foundation of mining development, and Tarku’s vision is to generate exploration projects with excellent potential for mining development for prospective partners or buyers. Tarku has 76,148,797 outstanding shares, of which approximately 70% are owned by insiders and major shareholders. Benoit Lafrance, P.Geo., PhD, Exploration Manager and Director of Tarku, is the qualified person under National Instrument 43-101 Standards of Disclosure for Mineral Projects who prepared, supervised and approved the technical information in this news release.